Want to see what has gone on in the Irondequoit real estate market during the month of April along with year over year comparisons? Here is the Irondequoit NY real estate market report April 2015 edition. In April 2015 there were 51 homes that closed during the month for Irondequoit NY real estate. This is 9 less than the 60 homes that closed in April 2014. The average sale price for the homes that closed in April 2014 was $120,883. The average sale price for the homes that closed in April 2015 was $120,812. The average market time (aka Days on Market) for the homes that closed in April 2014 was 51 days. The average market time (aka Days on Market) for the homes that closed in April 2015 was 44 days. The total amount of volume for the homes that closed in April 2014 was $7,253,003. The total amount of volume for the homes that closed in April 2015 was $6,161,433. There were a total of 165 homes in Irondequoit NY that were under contract or sale pending through April 30th, 2015 (of the 165 total homes, 67 homes went under contract during April 2015). The average market time for these 165 homes was 43 days. The average list price for these homes under contract was $111,460. There are currently 222 homes on the market in Irondequoit NY. The average list price is $130,096. The average market time for these homes is 50 days. Homes in Irondequoit NY are selling in about 30-40 days if priced properly. The market absorption rate, as of May 1st, 2015 was 3.69 in Irondequoit. This means that if no other homes in Irondequoit were put on the market, it would take 3.69 months to deplete the remaining homes on the market. How can both buyers and sellers have an advantage in the Irondequoit NY real estate market? Employ the services of a local Irondequoit real estate agent who has vast knowledge and experience of the market. For a complete list of available real estate in Irondequoit NY, visit Irondequoit NY Homes for Sale. Make sure to subscribe to our blog so you don’t miss out on any Irondequoit homes. Contact us to find out what your Irondequoit NY home is worth and to discuss your housing needs. 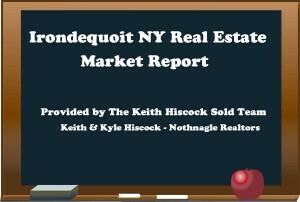 About the authors: The above information regarding the “Irondequoit NY Real Estate Market Report April 2015” was provided by the Keith Hiscock Sold Team. Keith Hiscock & Kyle Hiscock have over 30 years combined experience. If you’re thinking of selling or buying, we’d love to share our knowledge and expertise.